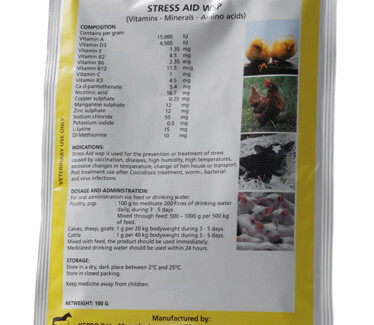 Stress Aid wsp is a carefully selected powder blend, consisting of vitamins, amino acids and minerals for use in poultry, calves, cattle, sheep, goats and pigs. 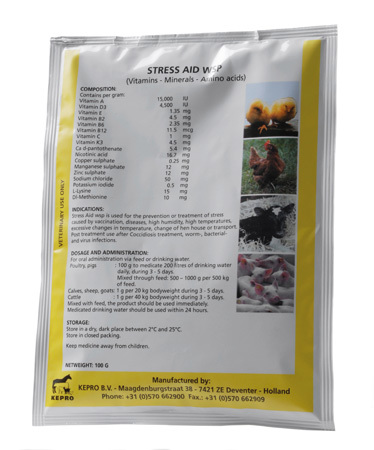 Stress Aid wsp is used for the prevention and treatment of stress, caused by vaccination, diseases, high humidity, high temperatures, excessive changes in temperature, transfer to a new hen house or transport. Post treatment use after Coccidiosis-treatment and worm, bacterial and virus infections. Poultry, pigs : 100 g to medicate 200 litres of drinking water, daily, during 3 – 5 days. Mixed with feed: 500 – 1,000 g per 500 kg of feed. Calves, sheep, goats : 1 g per 20 kg bodyweight during 3 – 5 days. Cattle : 1 g per 40 kg bodyweight during 3 – 5 days.